Cellulite and stretch marks are affecting women and men across the country, causing body issues. 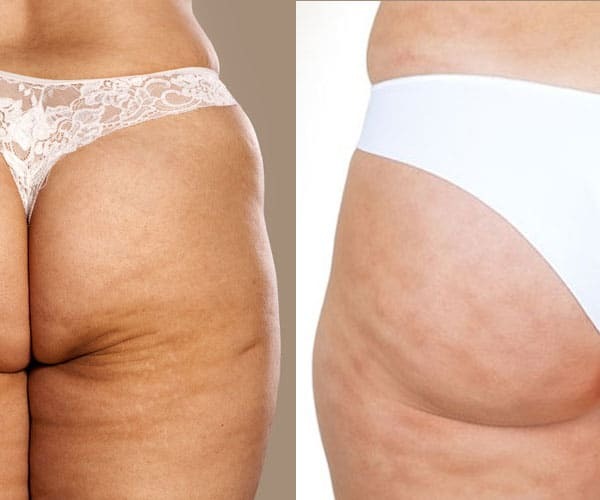 Over 90% of women have cellulite and 80% of women have stretch marks. Though both can cause self-confidence issues they are fairly different and have different causes and treatments. Stretch marks present themselves as red or purple stripes or marks in the skin. These indented streaks on your skin gradually fade to white/silver over time. They generally appear on the inner thigh, underarm, abdomen, breasts, buttocks or back. Cellulite is the dimpling of skin that occurs predominantly in women but can affect men. This rippling dimpling effect generally occurs on the upper thighs, buttocks, hips, and abdomen. Cellulite develops in the layer of fat that exists between skin and muscle. As fat cells build up they push against the skin, while the muscle cords pull down. This creates a dimpling in the surface. Cellulite can occur as a result of weight gain, a sedentary lifestyle, use of the pill or even stress. There is evidence to suggest it can be hereditary also. While more common in overweight individuals, anyone can be affected by it. Stretch marks occur as your skin tries to adapt to your body. As your body grows or changes rapidly your skin can’t always grow fast enough so it stretches. This causes the collagen to break down and exposes blood vessels that are damaged, causing the appearance of indented scars. Common causes of stretch marks include weight gain, pregnancy, and bodybuilding as your body changes or grows rapidly. They can also be caused by the overproduction of certain hormones. It can be difficult to ever fully get rid of cellulite or stretch marks. With cellulite weight loss can help along with some vitamin E creams and treatments to soothe the skin and provide a more even layer. There are laser treatments which though expensive have seen some good results. Treatment for stretch marks is reasonably similar. By maintaining a healthy lifestyle you promote your skin’s natural elasticity preventing stretch marks. Creams and oils containing vitamin E and fatty acids can be used to help repair the skin but for the best results, you’ll need to use laser treatment or surgery. Both Cellulite and Stretch Marks can have an impact on your body confidence, and while they do diminish over time there are options available to speed up the process. Always remember that there can be side effects and for all the information about treatment and the options available contact your dermatologist who will be able to recommend the best course of action.